I love Christmas. I love everything about it, the lights, the trees, the joy. 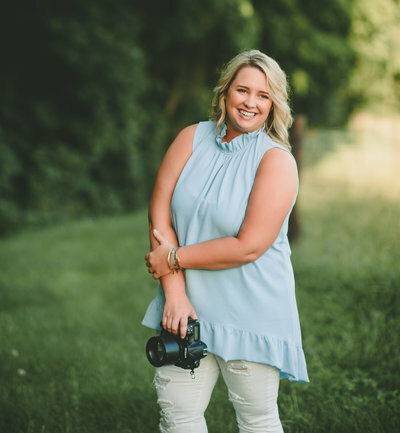 When I met Natalie and Steve for the first time they told me about their love for the season and how it would play a role in their wedding day. I was super excited to capture it for them! It was fitting for Natalie and Steve to get ready for their big day downtown at the Abraham Lincoln Presidential Hotel where they met downstairs at the Globe Tavern where Steve bartended. 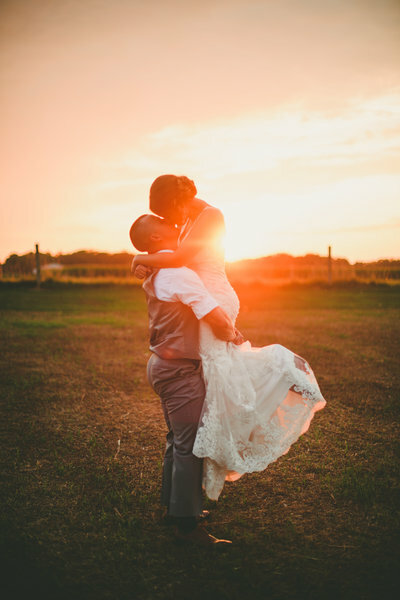 They shared an intimate first look where they read their personal vows and indulged in a celebratory champagne toast before heading out for their formal photos. We found some beautiful light among a rare evergreen tree downtown and the beautiful architecture that surrounded it. We then ventured on to the Old State Capitol, one of Natalie and Steve’s favorite spots in Springfield. I’m always excited to photograph couples at there because it’s such a unique backdrop. My favorite moment in the day was capturing Natalie and Steve under the lights of the plaza, which was something Natalie had talked about the first time we met. We were lucky with the weather, which was pretty mild for December. The flowers were absolutely beautiful with peonies and evergreen touches that complemented Natalie’s very simple but elegant dress. And oh my goodness they smelled just like Christmas! 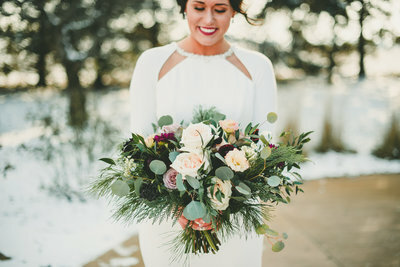 Both she and her maid of honor, Lauren, wore gorgeous furs and the lantern that Natalie chose for her in lieu of a bouquet was the perfect touch to their winter look. Natalie married Steve in an intimate evening ceremony in the downtown church where she grew up. It was perfect. Steve even shed a tear as Natalie walked down the aisle and after they were officially newlyweds their guests sent them off with jingle bells! The room at Maldaner’s was perfectly decorated to Natalie’s Christmas theme with trees, lights, red candles, and greenery. Even the smell from the greenery and the flicker from the candles was a constant reminder of the season and all its warmth and joy. The space was intimate and inviting with less than 50 of Natalie and Steve’s closest friends and family. Natalie and Steve are such great supporters of one another, they are kind, and their love shines through. They were so excited to capture their wedding photos and it was an absolute honor for me to do it for them. I know you will enjoy these photos as much as I enjoyed taking them! Love this detail shot by Lydia! OBSESSED over these moments Lydia also captured with Natalie and her father before the ceremony started. Maldaner’s was the perfect spot for Natalie and Steve’s intimate Christmas wedding! This was one of my favorite parts of the evening – night photos outside the beautiful restaurant. They always have it decorated so beautifully with lights!